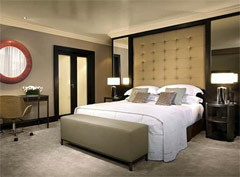 A five-star luxury hotel conveniently located on the main shopping street in Dublin city centre. One of The Leading Hotels of the World and rejuvenated by a multi-million euro refurbishment. Its presence on Grafton Street, with St Stephen’s Green and Trinity College at either end, puts the city’s history, culture and entertainment within walking distance and ensures a perpetual hum of comings and goings. Beautifully refurbished and appointed, all bedrooms offer sumptuous custom-designed furnishings, Sealy beds with luxurious Frette linen, silk curtains, state of the art music systems and Acqua Di Parma bathroom products. Take a seat and raise a toast to four unique dining experiences under one roof. There’s a spot for every taste and every time of day, from The Gallery’s civilised surroundings and the fun, fresh Café Novo to the fine modern dining of Wilde, the restaurant and the allure of The Marble Bar. Choose any of the fine Dublin Restaurants for tea, coffee or a cocktail, lunch, dinner or a snack, at anytime of the day or evening. The Buff Day Spa 52 South King St., Dublin 2 (Beside The Gaiety Theatre) Massages, body treatments, spa packages, manicures, maternity and beauty services. The hotel conference centre offers a suite of seven boardrooms and one suite, all refurbished and re-equipped. The hotel business centre, comprehensively equipped with office facilities, is available around-the-clock to hotel guests and meeting room clients. To make life easier for business customers, all guest rooms include complimentary high-speed Internet access, Blackberry chargers, dedicated work areas and media hubs for plugging in your PC and rehearsing that all-important presentation. The hotel is located in the city centre in the main shopping district, it is walking distance to restaurants, bars, museums and the theatre. The hotel is 12km from Dublin Airport and close to the main railway stations by bus or taxi.